At the 34th meeting of the Heads of Government of the Caribbean Community (CARICOM) on July 6, a British human rights law firm has been contacted by CARICOM to to seek compensation from some European countries for the horrors of African slavery and the genocide of the region’s native peoples. Last week throughout the English speaking Caribbean, people celebrated the national holiday of “Emancipation Day,” which marks the passage of the Slavery Abolition Act that brought an end to the formal institution of slavery throughout the British Empire in August 1834. While Emancipation was a monumental step forward for the peoples of the Caribbean, it left behind a legacy of widespread poverty, underdevelopment, and dependency which continue to pose serious problems for the region as a whole. At the 34th regular meeting of the Heads of Government of the Caribbean Community (CARICOM) on July 6, the member states created the National Reparations Committee, with Barbados, St. Vincent and the Grenadines, Haiti, Guyana, Suriname, and Trinidad and Tobago providing political oversight. It has been confirmed that Leigh Day & Co., a British human rights law firm, has been contacted by CARICOM to consider going forward with a legal challenge to seek compensation from the United Kingdom, France, and the Netherlands for the horrors of African slavery and the genocide of the region’s native peoples. Leigh Day & Co. was previously victorious in fighting the British Government for compensation for hundreds of Kenyans who were tortured by the British colonial government during the “Mau Mau Uprising” in the 1950's. 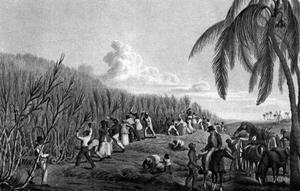 While a specific dollar amount has not been referenced so far, Prime Minister of St. Vincent and the Grenadines Ralph Gonsalves and Chairwoman of the National Reparations Commission in Jamaica, Verene Shepherd, remarked in an interview to the Associated Press that “Britain at the time of emancipation in 1834 paid 20 million pounds to British planters in the Caribbean, the equivalent of 200 billion pounds today.” Gonsalves added that any money received is not going to be handed to individuals, but will be directed towards economic, social, and cultural programs. It remains to be seen how CARICOM’s Reparations Commission will be received by the United Kingdom, France, and the Netherlands. While it has been stated by both the Commission and attorney Martin Day that it is hoped that a negotiated settlement can be reached, no doubt it will strain relations between the two regions. After all, the call for reparations within the Caribbean is not without precedent. In a separate reparations case in 2003, Haitian President Jean Bertrand Aristide demanded that France pay Haiti back $21 billion (the equivalent of 90 million gold francs when inflation is considered) which is the sum Haiti was forced to pay France for “lost property” and diplomatic recognition after their successful revolution in 1804. Aristide made it very clear that despite the impossibly large sum of money for Haiti to pay at that time, the government from 1825 to 1947 was forced to repay the French or face the deployment of gunships and economic sanctions. Despite the historical validity of the demand by put forward by Aristide, it was dismissed by the French government, that stated they already provided Haiti with millions of dollars in aid and belittled his motives, arguing that this was little more than an effort to distract his population from matters of corruption and poverty in Haiti. Realistically, it can safely be assumed that the French were afraid that this would then set a rather expensive precedent for other colonized nations to follow and the coup in February 2004 removed both Aristide and the issue of reparations from the international spotlight. For those seeking more information on the deep and lasting legacy of slavery, genocide, and colonialism, they have been studied in great detail, outlined in ground-breaking books such as Walter Rodney’s How Europe Underdeveloped Africa, Eric Williams’ Capitalism and Slavery, Clive Y. Thomas The Poor and Powerless, and Hillary Beckles' Britain’s Black Debt.